Fractals and wavelets are emerging areas of mathematics with many common factors which can be used to develop new technologies. 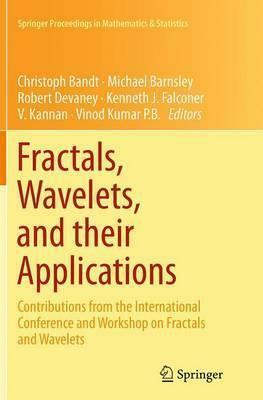 This volume contains the selected contributions from the lectures and plenary and invited talks given at the International Workshop and Conference on Fractals and Wavelets held at Rajagiri School of Engineering and Technology, India from November 9-12, 2013. Written by experts, the contributions hope to inspire and motivate researchers working in this area. They provide more insight into the areas of fractals, self similarity, iterated function systems, wavelets and the applications of both fractals and wavelets. This volume will be useful for the beginners as well as experts in the fields of fractals and wavelets. Illustrations note 81 Illustrations, color; 44 Illustrations, black and white; XII, 508 p. 125 illus., 81 illus. in color. Part I: Fractal Theory.- Introduction to Fractals.- Geometry of self similar sets.- An introduction to Julia and Fatou set.- Crazy topology in complex dynamics.- Measure preserving fractal homeomorphisms.- The dimension theory of almost self affine sets and measures.- Countable alphabet non autonomous self affine sets.- On transverse hyperplanes to self similar Jordan arcs.- Fractals in product fuzzy metric space.- Some properties on Koch curve.- Projections of Mandelbrot percolation in higher dimensions.- Some examples of finite type fractals in three dimensional space.- Fractals in partial metric spaces.- Part II: Wavelet Theory.- Frames and extension problems I.- Frames and extension problems II.- Local fractal functions and function spaces.- Some historical precedents of the fractal functions.- A new class of rational quadratic fractal function with positive shape preservation.- Interval wavelets determined by points on the circle.- Construction of multi scaling functions using matrix polynomials.- A remark on reconstruction of splines from their local weighted average samples.- C1rational cubic fractal interpolation surface using functional values.- On fractal rational functions.- Part III: Applications of Fractals and Wavelets.- Innovation on the tortuous path: Fractal Electronics.- Permutation entropy analysis of EEG of mild cognitive impairment patients during memory activation task.- A multifractal based image analysis for cervical dysplasia classification.- Self similar network traffic modeling using fractal point process Markovian approach.- Validation of variance based fitting for self similar network traffic.- Self similar network traffic modeling using circulant Markov modulated poisson process.- Investigation of priority based optical packet switch under self similar variable length input traffic using matrix queuing theory.- Computationally efficient wavelet domain solver for fluorescence diffuse optical tomography.- Implementation of wavelet based and discrete cosine based algorithms on panchromatic image.- Trend, time series and wavelet analysis of river water dynamics.- An efficient wavelet based approximation method to film - pore diffusion model arising in chemical engineering.- A new wavelet based hybrid method for Fisher type equations. Some key contributors and editors include Robert Devaney, Michael Barnsley, Christoph Bandt, M.Urbanski, Mark Pollicott, Peter Massopust who are the founders of fractals; Scott Sutherland, Jeff Geronimo who are the pioneers in the field of Complex Dynamics; Bin Han, Karoly Simon and Vladimir Protasov who are the experts in the area of Wavelets.